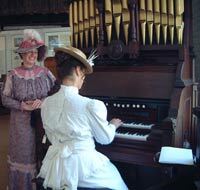 Welcome to the Estey Organ Museum website. We hope you will visit often and interact with us with your inquiries and your knowledge of everything “Estey”. This museum and its site in Brattleboro, Vermont are of interest to many people, ranging from organ aficionados to architectural and social historians. The Estey Organ Company and its remaining slate-clad buildings represent a highpoint in 19th century manufacturing, whose products can still be found all over the world today. We hope you enjoy learning about them and will come to visit us both on line and in person if you can. From the late 1800s through the 1950s, the name Estey was known worldwide for the manufacturing of its reed, pump, and electronic organs. In fact, Estey organs could be found on six continents. By the time the company closed its doors in 1960, Estey had hand-crafted over 3,000 pipe organs and over half a million reed organs. Although the name of Jacob Estey and the historical and musical significance of the Estey Organ Company is remembered chiefly by organists and owners of these instruments, the Estey Organ Museum is trying to recapture a unique time in both musical and manufacturing history, from the point of view of Estey’s owners, workers, customers, and neighbors. The Estey Organ Museum is a non-profit organization. Managed by a Board of Trustees, we are a membership organization and also rely on donations and grants, and are supported by a cohort of dedicated volunteers. We invite you to join us in our effort to share the Estey Organ heritage. We welcome your interest and support.